Was this a renovation or a new design? What did your client wish to achieve? They wanted an elegant kitchen with a lot of Carrara marble, whites, and neutral tones. It was a old kitchen that needed an update that would blend seamlessly with the rest of the renovations in the house. They like to entertain, and chose a large range and fridge to accommodate that. The center island was extended to include more seating for friends and family. They also added a butcher block to the end of the island closest to the dining room, where they can prep food and appetizers while hosting. What did you, as the designer, hope to achieve? I wanted to blend the new kitchen with the rest of the home, creating a fresh, clean design that was both formal and fun. The original kitchen was dark and had yellow and blue tones, which did not harmonize with the rest of the home. 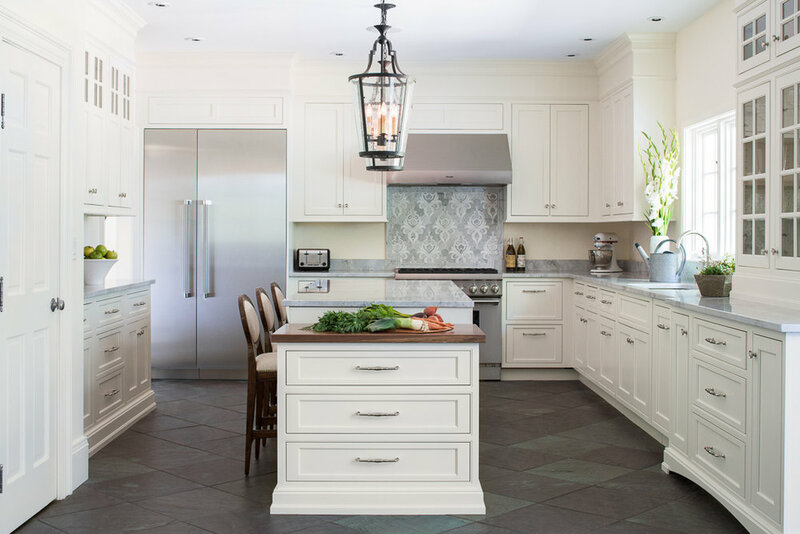 The new kitchen has polished nickel hardware, which is a chic contrast to the wood tones and rustic character of the original honed slate floor. How did you balance your client’s vision with your own? We both started with the same vision; they are clients that I had worked with in the past and we were always on the same page. It took a lot of work to find the perfect light fixtures for over the island. The moment we came across the black Fergus lanterns from Currey and Co. we knew it was the right fit.